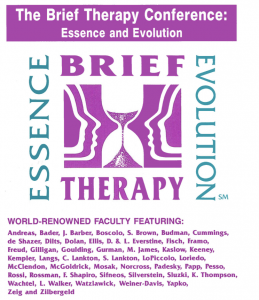 The Milton H. Erickson Foundation sponsored the first Brief Therapy Conference in San Francisco in 1988. That meeting doubled as the Fourth International Congress on Ericksonian Approaches to Hypnosis and Psychotherapy. Approximately 2200 professionals from the United States and 24 countries met at that meeting to learn various aspects of brief therapy. The proceedings of that Conference, edited by Stephen Gilligan, PhD, and Jeffrey K. Zeig, PhD, were published in Brief Therapy: Myths, Methods, and Metaphors by Brunner/Mazel in 1990. The Second Brief Therapy Conference was held in Orlando, Florida, in 1993. It was organized as a brief therapy conference in its own right, separate from an Erickson Congress. The Third Conference was held in December 1996 in San Francisco. These two Conferences were each attended by approximately 200 professionals. 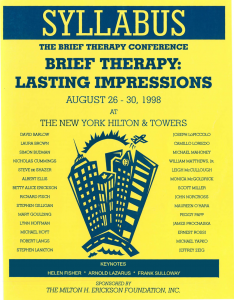 The program for the 1998 Fourth Brief Therapy Conferences was designed so the attendees could select from a wide variety of training courses. Registrants picked the format that best suited their needs; there were academic and experiential components to the meeting area. The academic component consisted of keynote addresses and invited addresses. There were three keynote presenters: Helen Fisher, PhD; Arnold Lazarus, PhD; and Frank Sulloway, PhD. There were 27 invited addresses, which are the chapters that appear in the book Brief Therapy: Lasting Impressions, edited by Jeff Zeig. The experiential component of the Conference consisted of three-hour workshops and one-hour interactive events. Forty-seven workshops and short courses were offered. A format change of the third day of the Conference gave attendees an opportunity to witness interactive events. One-hour clinical demonstrations, conversation hours, and panel discussions were featured. Short courses also were presented during the Conference. There were twenty 90-minute mini-workshops covering a wide range of topics on brief therapy. The entire faculty consisted of more than 59 members, including moderators, co-presenters, and keynote faculty. The above is an excerpt from Brief Therapy: Lasting Impressions, edited by Jeffrey K. Zeig. This book and many others, as well as audio and video recordings from various Brief Therapy Conferences can be found on our online store. For more information about the Foundation and its programs, newsletter, other publications, web-based activities, audio- and videotapes, bibliographies, and the location of the Erickson Institutes around the world, please visit www.erickson-foundation.org.